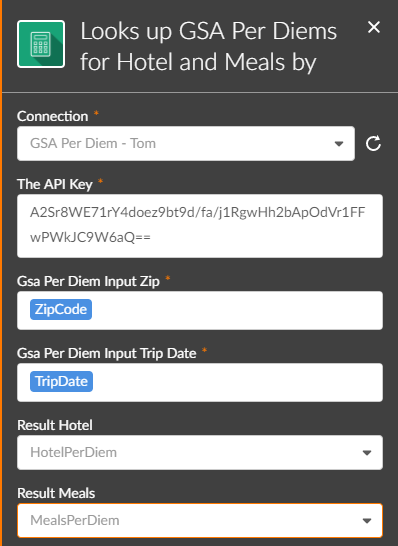 My sample project here was to build an Azure Function that wrapped the GSA Per Diem API, making it easy to consume as an Xtension in Nintex Workflow Cloud. The use case for this would be workflow designers creating a solution for Travel Authorization Requests and/or Expense Reports. This custom workflow action could validate that the amount of expenses for Meals and Hotels is within the limit allowed by the GSA. 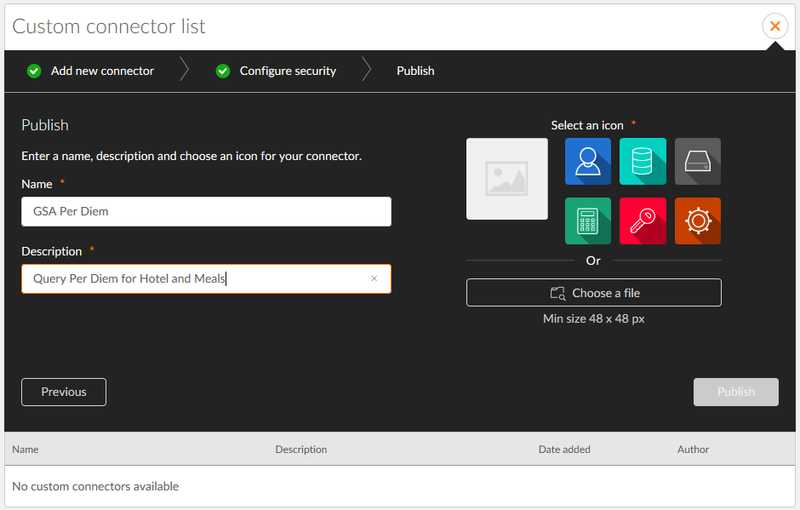 Now that we’ve created our Azure Function, we’re left with the best part of the solution – importing it into Nintex Workflow Cloud as a new new Xtension / Connector. After logging into your NWC tenant, click on the Xtensions link on the left side of your Dashboard. The click the orange plus (+) sign on the right side. This will display the Connector Definition dialog. 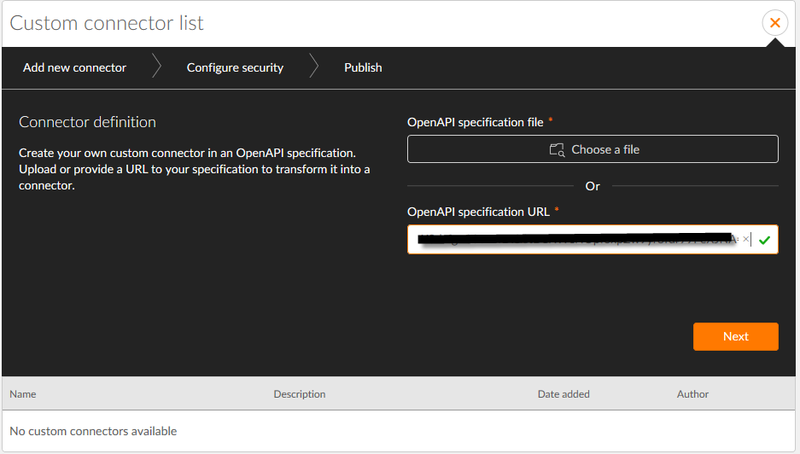 Simple copy and paste the API Definition URL into the textbox for the OpenAPI specification URL (see bottom of part 2 for how to obtain this URL in Azure Portal). After pasting the URL, NWC will immediately validate the definition and display a green checkmark on the right. Then click Next. This will display the Security dialog. We can accept the default settings here. 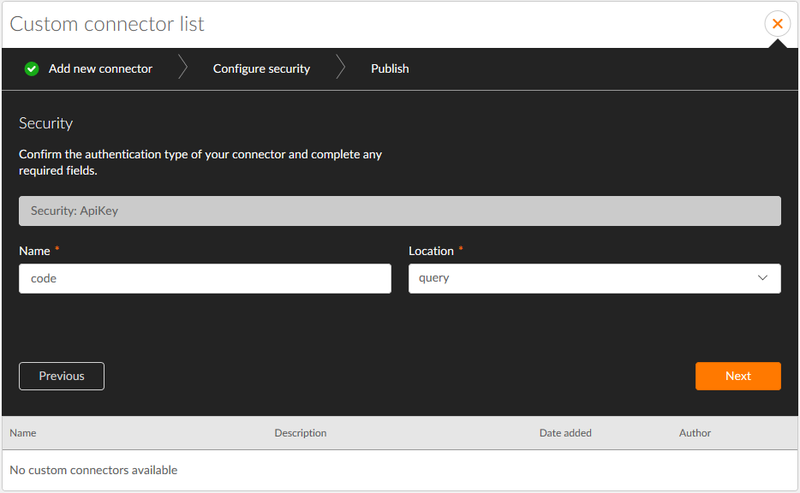 These settings indicate that Nintex Xtensions will use an APIKey for security to call our Azure Function (the APIKEY is the token at the end of the API Definition URL) and it will pass the APIKEY value as a parameter named “code” in the URL querystring. The APIKEY shall be entered by the workflow designer when they use the GSA Per Diem action within a workflow. Click Next to continue. This will display the Publish dialog as shown below. Enter a Name and Description for the Connector. 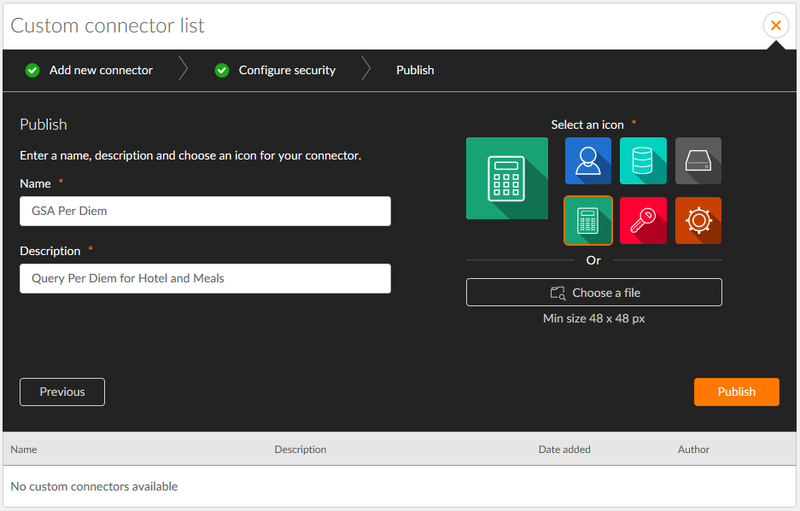 Then click on one of the available icons or if you prefer you can upload your own icon. Then click the Publish button. Now, we can actually use our custom Connector in an NWC workflow! 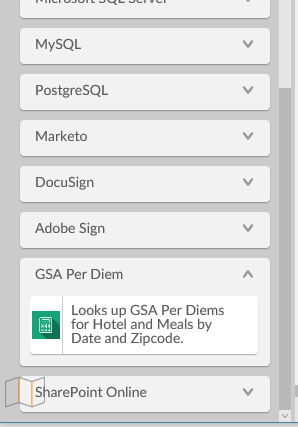 So, lets create a new Workflow and when we review the toolbox, we’ll see our new GSA Per Diem connector. If we expand the GSA Per Diem section, we’ll see the specific action that corresponds to our Azure Function. Note that the name displayed for this action is defined in our Swagger definition, as the summary. So if we prefer a different name for the action, we can change that summary value (see part 3 for details). The API Key – You may use the same API KEY that was provided in the API Definition URL. 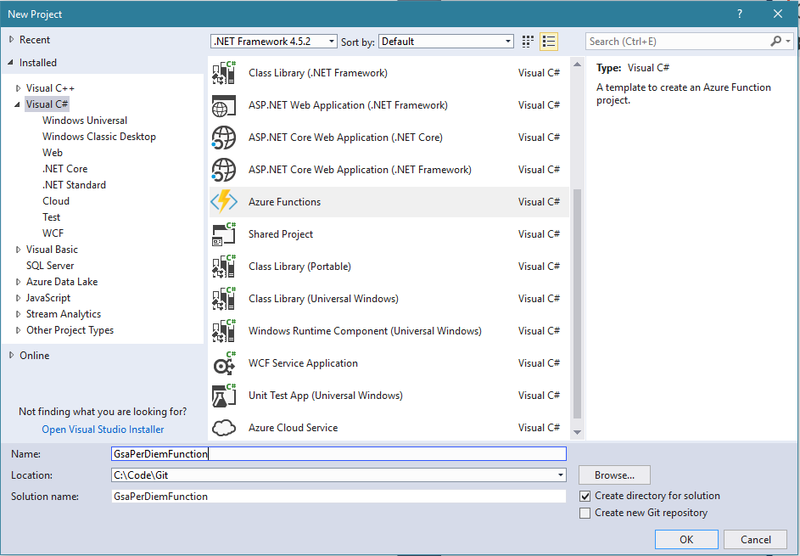 Azure Functions also allows you to create and manage additional API KEY for your function app. 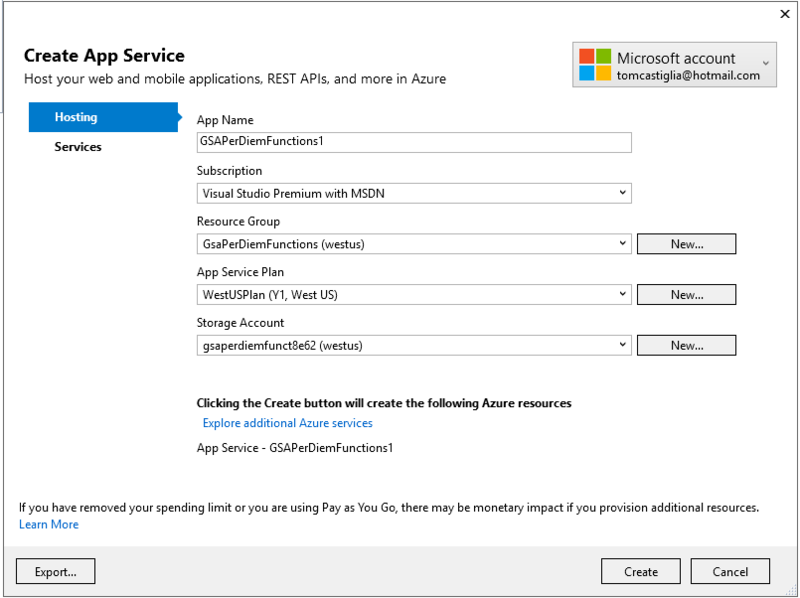 This can be done from the Settings screen of your Azure Function App. Gsa Per Diem Input Zip – assign this to the ZipCode start event variable. Results Hotel – Define a new variable of type integer called HotelPerDiem. This is an output variable that will be populated by this action. Results Meals – Define a new variable of type integer called MealsPerDiem. This is an output variable that will be populated by this action. 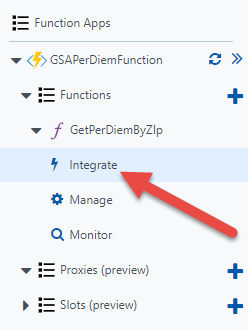 So we have no concluded our project to implement a solution using C# & Visual Studio to develop our logic within Azure Functions, and import our API definition as a custom connector for Nintex Workflow Cloud. The expected scenario with this example, is that we may capture actual Meal and / or Hotel expenses and compare those against the allowed Per Diems. If the actual expenses exceeds the Per Diem the workflow may taken certain actions like automatically reject or route for special approval. But you can hopefully adapt the concepts here for any custom business logic or integration scenarios that you can imagine. Good luck! 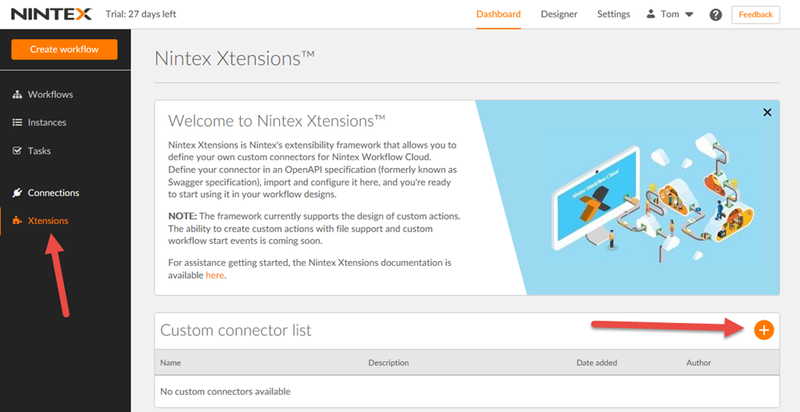 This article is part 3 of a 4 part series, where I’ll cover editing of the Swagger definition file that we’ll import into NWC in part four in order to create the actual Nintex Xtension. 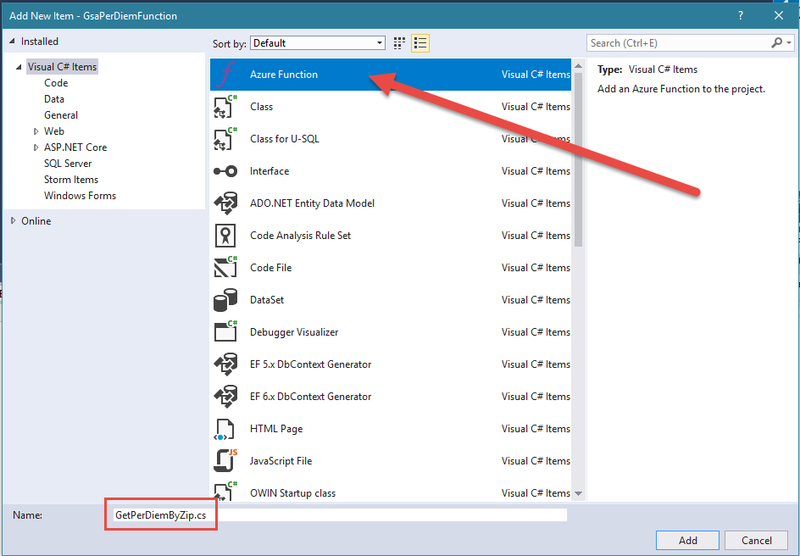 In part 1, I covered the steps to setup your Azure Functions and Visual Studio environment, and in part 2 I covered the C# code that was developed and published to Azure Functions. 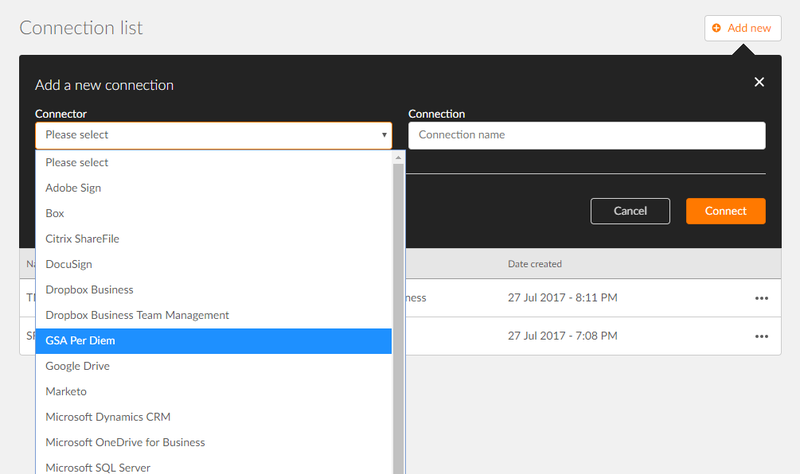 In part 4, we’ll import our Azure Function into Nintex Workflow Cloud as a new Connector using NWC’s Xtensions framework. Now that the allowed methods are set, we can create our Swagger API Definition. Creating a Swagger Definition was a new experience for me and there are various tools out there that can help with the process. 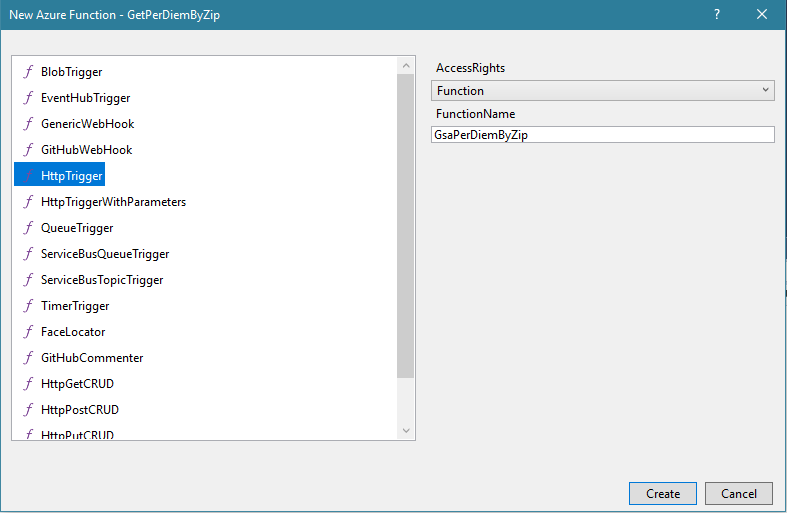 One tool is built into the Azure Functions portal site, and that is primarily where I created my definition. But you can also use the native editor at http://editor.swagger.io/. 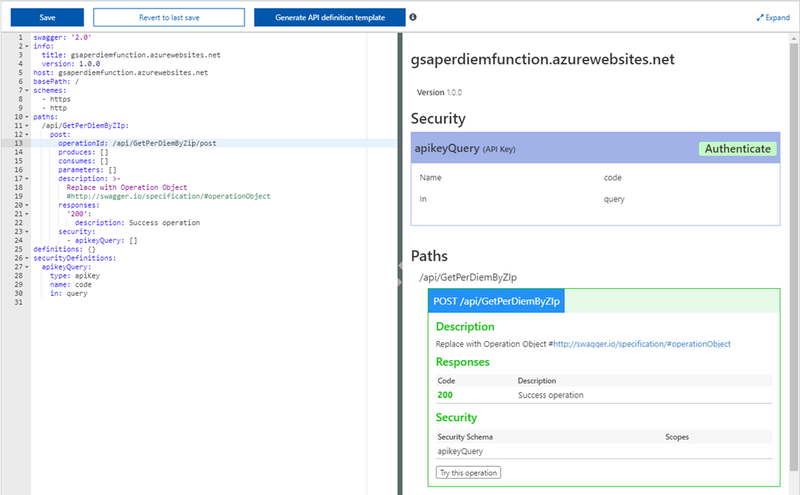 Although both editors are very similar, there were a few things that I found easier to figure out on the Swagger site than in the Azure Portal, so I used both of them. But we’ll start in the Azure Portal. Regardless of the editor that you use, you create your swagger definition using a language call YAML, which stands for “YAML Ain’t Markup Language”. Instead its described as a “a human friendly data serialization standard for all programming languages”. The output of a Swagger definition is JSON, but you edit with YAML. 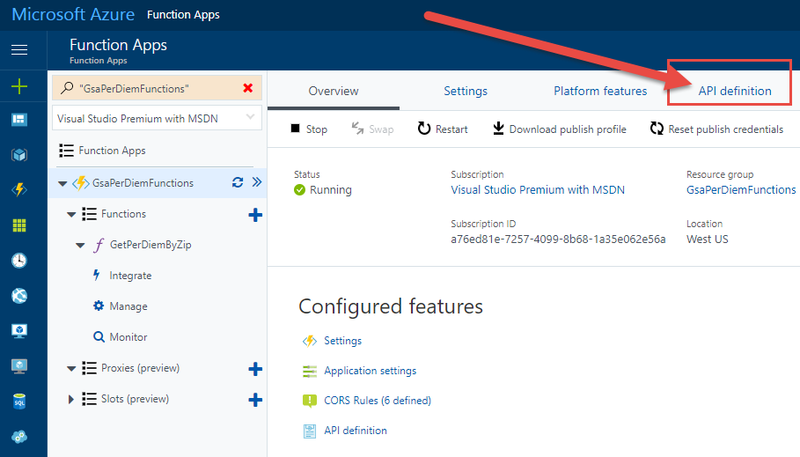 Navigate to your Function App in Azure Portal, and click on the API Definition link. 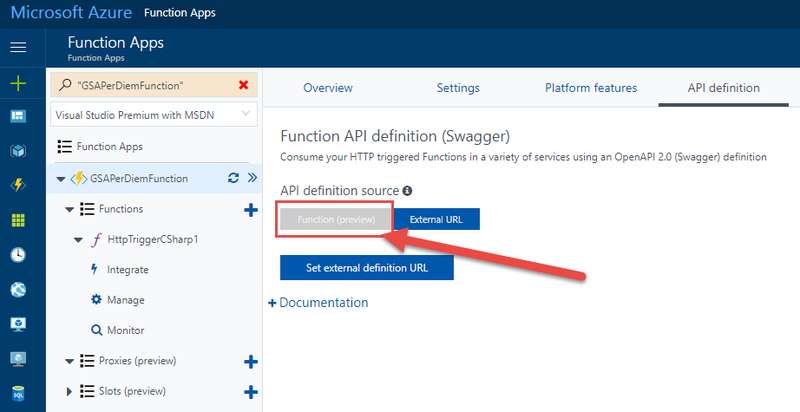 This will display the Function API definition (Swagger) page. For API definition source, click on the Function (preview) button. 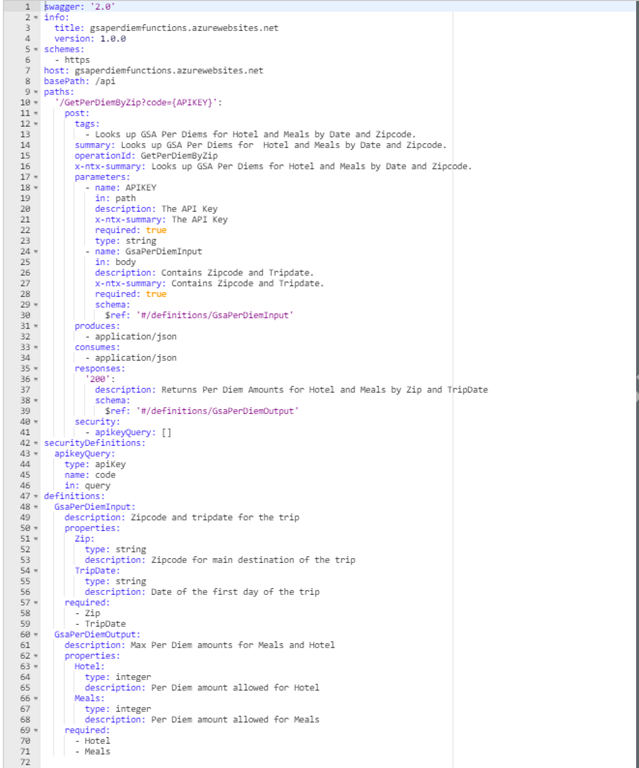 Click on the button for Generate API definition template. This will generate a boilerplate API definition based on the metadata about your function, as shown below. As you edit the swagger definition, it will validate your changes and provide error details in real time. "Looks up GSA Per Diems for Hotel and Meals by Date and Zipcode." "description": "Zipcode for main destination of the trip"
"description": "Date of the first day of the trip"
"description": "Per Diem amount allowed for Hotel"
"description": "Per Diem amount allowed for Meals"